I got around this by just setting the video cable to TV output (there’s a little switch on the part you connect to the 360). I didn’t need to connect the box to a TV, worked fine on my HDTV beamer – I could switch the video output to PAL-60. Same problem here. Just bought The outfit but i cant play because of that error. Have a Hitachi 55″ plasma. Dont know if this helps. Just brought “Top Spin 2” and got same problem – I’m using HD cable (dont know what type, just the normal one that is XBOX360 branded. Anyway, to get round it I plugged original TV cable (that came with XBox360 when I brought it) and back came the PAL-50/60 setting. Changed it to PAL-60, then plugged HD cable back in… Job Done. guys, same problem as above, lcd panel only. could you give us a description of how the display settings are structured in the dashboard when you have a TV connected? then i could connect my HDTV cable (set to TV), press the right button sequence on the controler, change the setting to PAL60, reconnect VGA, etc. can’t find this anywhere else, help! 1. connect your 360 to your tv via the scart or composite input. 2. 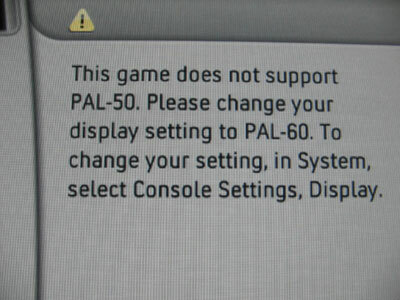 Start your 360, and go to the display options, you can now switch to pal 60. 3. Now you have done that, reconnect your 360 to the TV via your component cables. Yes it is SO EASY. However, not everyone has a TV… I don’t have a TV because TV is opium for the masses. I have a hitachi 55″, there is no need to change the component cable. Just flick the switch on the component cable, change the settings in the menu, switch of console and swith back to hdtv. refer to following. it worked for me and much easier than changing cables. Find the HDTV switch on the AV Connector, and then set the switch to TV. Set the HDTV switch on the AV Connector to HDTV.